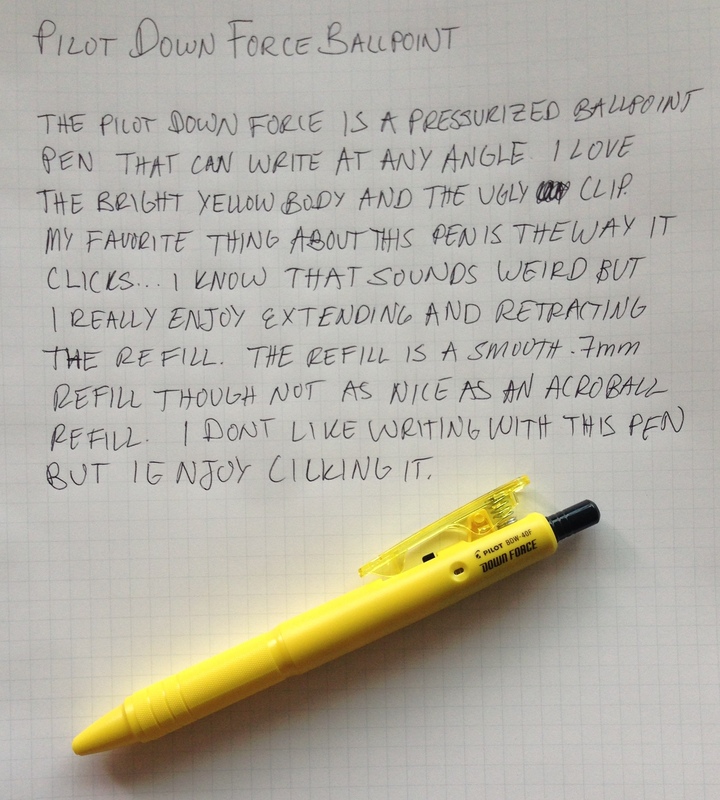 The Pilot Down Force is a pressurized ballpoint pen that is designed to write at any angle. I don’t have any need for a pressurized pen but I liked the loud yellow body so I bought it as an impulse buy. My favorite thing about this pen is the satisfying click it makes, apart from that and the bright yellow body I didn’t find much else to like. The plastic body is a bit too fat for my taste and the 0.7mm refill is okay, not as nice as what you find in a Pilot Acroball. The line is darker and sharper than a Fischer Space pen’s and it’s cheaper but at $8 its not cheaper than a Uni Power Tank. The Uni Power Tank is writes better, is pressurized and costs less than half the price of the Down Force. If you really enjoy clicking pens the Down Force might be worth a look but if you just want a nice pen don’t bother; this one’s crap.